Boil whole pot of water, salt it and boil pasta along the instruction on the package. Clean and slice mushrooms, shred or dice garlic cloves, cut mushrooms into strips. 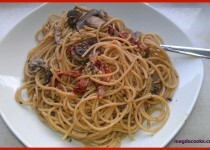 Heat olive, add garlic and after 30s or after the scent is cleaning your sinuses, add mushrooms. Patiently saute it or like me fry it on high heat. Add tomatoes and make sure to remember to reduce heat. Pour the broth in and continue cooking until liquid reduces. Add sour cream and boil on high heat for another few minutes. Try the sauce, if it’s enough salty - don’t add even a pinch, if you think it’s not salty enough - add a little bit and some fresh ground pepper. Add cheese, keep cooking for another few minutes. Don’t forget to stir it from time to time. Sauce should be semi thick, cheese should melt. If you feel like the sauce is too thick, add a little more sour cream, if you worry it’s too liquidy, don’t ;-) pasta will absorb most of it. Sprinkle with basil and serve. It was rich meatless meal, aromatic and filling. 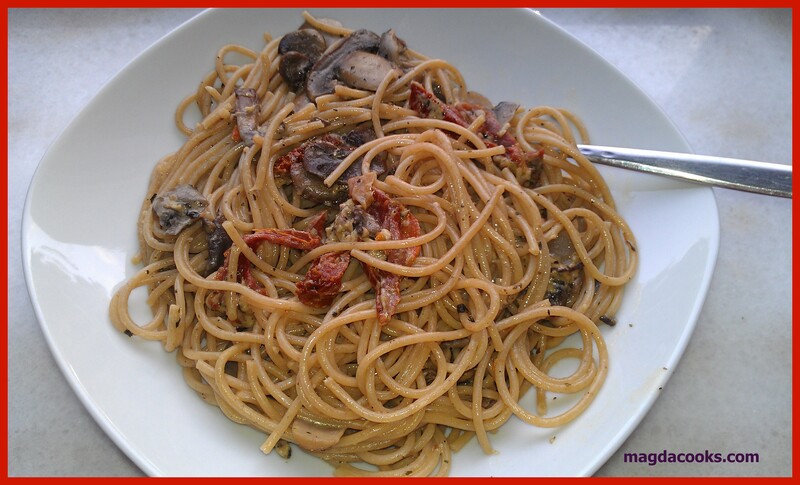 If you would like to add a little twist ...fry diced chili pepper with garlic, then add mushrooms. P.S.Cookies thoughts: I’m cheap?! What… me… never… :) and about the meal, of course, my cheapness made me like it a lot… (and it was tasty too!) soooooo, Magda Cooks… it just right.